Changes for the 2018-19 edition of the Buffalo Beauts continue to happen, but it looks as if the team’s front office will finally be standing on solid ground. Word was released on Jan. 11, 2019 that head coach Cody McCormick has now additionally been named General Manager. The Beauts made the announcement from their Twitter account. 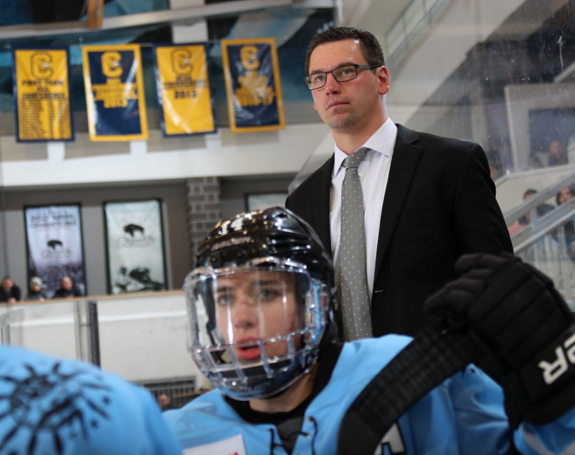 Buffalo Beauts head coach Cody McCormick was named the team’s General Manager on Jan. 11, 2019 (Photo provided courtesy of the Buffalo Beauts). McCormick fills the role that was previously held by former Buffalo GM Nik Fattey. Some sort of announcement was to be expected after word came out on the evening of Jan. 8 that Fattey had resigned from the position. Offering the GM duties to McCormick was the best decision that Buffalo could have possibly made. The Beauts players have responded well to his systems in a short period of time, and there is a noticeable positivity among the players when speaking with media since McCormick’s arrival to the team. This is the fourth noteworthy change to occur for the Buffalo Beauts in slightly more than a month’s time. Firstly, on Dec. 7 the team relieved longtime coaching partners Ric Seiling and Craig Muni from their respective duties as head and assistant coaches. The move was somewhat called into question at the time. Even though Buffalo posted a mediocre 3-3 record when the move was made, Seiling and Muni had led the team to the 2017 Isobel Cup championship. With Seiling at the helm, the Beauts made three straight trips to the Isobel Cup Final in the first three seasons of the NWHL. The long-term history of both coaches brought some criticism upon the decision to fire them. Then secondly, once Seiling and Muni were let go they were immediately replaced by McCormick as interim head coach and Fattey as interim assistant coach. What is interesting to point out in retrospect is that Fattey only ever served one game on the bench. Less than 24-hours after the Seiling and Muni firings, the Beauts played the Connecticut Whale on Dec. 8. With McCormick unavailable due to a prior engagement with the indigenous community, Fattey filled in as head coach for the game and led the Beauts to a 3-1 victory. But in the three Beauts games since that win, Fattey was not seen on the bench once. There was also no official notification that McCormick had the interim status removed from his title, although it obviously appears that the position is indeed permanent. Cody McCormick has been named interim head coach. Third – and mostly unrelated to managerial and coaching moves – the Beauts had to say goodbye to one of their best defenders right after the start of the new year. NWHL All-Star defender Sarah Edney played her final game with the Beauts on Jan. 5, as she is now pursuing dental school overseas in Australia. While the Beauts shared that Edney’s imminent departure was already known internally and had been prepared for prior to the 2018-19 season getting underway, she still leaves a sizable gap on the blue line and in the locker room. Just another challenge and change that the Beauts had to encounter. Finally and most recently, just three days after Edney’s departure came the word of Fattey’s. While everyone is allowed to make their own changes in their personal lives, this resignation was not expected by a long shot. After all, the 2018-19 Buffalo Beauts were very much Fattey’s team. He was the one who had orchestrated such maneuvers as bringing aboard prized Olympians like goaltenders Shannon Szabados and Nicole Hensley, as well as forward Dani Cameranesi and returning defender Emily Pfalzer. Fattey also brought about All-Star signings in the likes of goal-sniper Kelly Babstock formerly of the Whale and bullet-shooting defender Blake Bolden who had most recently played with the Boston Pride. While the reasoning given from Fattey was a desire to be more involved in other interests – such as the craft beer business that he co-owns – the parting of ways still comes across as odd and strangely timed. Regardless of the reasoning for it, his resignation creates a great opportunity for McCormick to truly sculpt the team as his own. Through the three games that McCormick has filled the roll of Beauts head coach, the team has generated a record of 2-1. Perhaps more noteworthy is the fact that they have outscored their opponents 10-2 in those games. Buffalo’s next game is Saturday Jan. 12 at 1:30PM against the Metropolitan Riveters. It will be the first for McCormick as both head coach and General Manager. With him now fulfilling both roles, an overall stability for the team may now have been achieved.